See the post later in this thread for the final solution. I thought it might be nice to have a Pi Zero W that I could plug into any computer like a dongle using the USB port and run Mathematica seamlessly in a window on the host computer. First I enabled WiFi on the Zero. Second, I configured the Zero for USB Ethernet gadget mode with 192.168.7.1 as a static IP address. Finally, I configured a DHCP server on the Zero to provide an address in the same subnet to the host computer. This worked well. Thus encouraged, I downloaded the latest version of xpra, which is a multi-platform seamless remote display server and client. I installed from source because the version included with Raspbian was too old to function reliably. Note that there are up-to-date binaries available for Windows, Mac OSX and x86 Linux. I chose a PC running Debian linux for the host computer and again installed xpra. Note that since all communications are running point to point over a directly attached USB cable there is no need to encrypt the connection. After some time, the remote Mathematica window from the Zero will appear among the local windows running on the host computer. It was possible to integrate, differentiate, draw a 2-dimensional graph and plot a 3-dimensional surface. During this time swap reached about 22MB on the Zero while xpra used from 15 to 50 percent of the CPU. On a well provisioned system xpra is supposed to be faster than tunneling X through ssh; however, both options seem slow in this case. Maybe the future will bring a faster Zero that can still be back-powered through the data port like a USB dongle. Last edited by ejolson on Mon Apr 30, 2018 7:32 am, edited 2 times in total. But why not just use VNC to remote into the Pi - whats the advantage of faffing with this xpra stuff? As far as I know VNC exports the whole Raspbian desktop, whereas xpra only exports the Mathematica window which then appears as just another application running alongside the local windows on the host computer. I could be wrong about VNC. Is it possible to export only the Mathematica window and not the rest of the Raspbian desktop? whereas xpra only exports the Mathematica window which then appears as just another application running alongside the local windows on the host computer. I downloaded the latest version of xpra, which is a multi-platform seamless remote display server and client. Thanks for bringing xpra to my attention. I routinely access my headless RPis with ssh -X (or its equivalent in the PuTTY windows app) in conjunction with a standalone X-windows server such as XMing, but it is always useful to know of viable alternatives. As with your example, I rarely need access to the whole RPF Desktop, but just want to run individual X-windows client applications. I'll be giving xpra a trial run. xpra is a *BEAR* to compile. I spent most of an afternoon trying - and eventually gave up in disgust. As OP notes, there is a version in the repos, but it is old and doesn't work. Correction; It works, but very, very slowly. So, don't even bother with that version. The problem is that xpra requires CPython (whatever that is) and CPython isn't there by default (note: It may be there now, it wasn't when I tried this). Getting CPython installed and working is a known deep, dark hole. When I tried to get it installed, it spent an entire afternoon repeatedly re-compiling itself. Weird. Back to the original question of "Why xpra? ": First of all, xpra bills itself as "screen for X" - i.e., a way to have an X session going, that survives network disconnects. But, as noted in this thread, VNC does that too, so I don't really think there's any point to xpra (though I'd still be interested in trying it out, if it can be compiled). However, you want to use VNC in the "create a new session for me" mode, not the "MIrror the HDMI display" mode. That's the key. You will want to customize the newly created session to be running as little extra cruft as possible - you certainly don't need the regular "Raspbian Desktop with Pixel and everything else" desktop (Yes, I know Pixel is a word we're not supposed to use anymore, but let's let that pass...). Now, as noted in the OP, it is true that the "normal" method of getting X is to "tunnel" it through "ssh". But, as OP notes, this is slow for any non-trivial graphical application (most people just use it for basic stuff - a few Xterms, maybe a clock...) So, OP is right to be seeking an alternative to ssh. In the next paragraph, I will describe an alternative that I think OP might be interested in trying. Note that, in fact, using socat this way is just a workaround for the fact that modern X invocations on Linux systems include the option "-nolisten tcp" - which disables accessing the X server over the network. They do this for some dumb "security" reason. socat allows us to put back this functionality. It's all safe enough, provided you're behind a router/firewall, and you trust your family members. There may be options in socat and/or xhost to tighten this up if needed, but I've never delved into it. Getting CPython installed and working is a known deep, dark hole. This installed version 0.25.2 which seemed good enough for compiling xpra. Since I started with Raspbian Stretch Lite I also needed to install the package python-rencode and a bunch of other stuff. where 192.168.7.3 is the IP number of the host found by ifconfig above and :3 is the X display number of the host found by the echo. Again, no encryption is needed because we are communicating to the Zero over a point-to-point USB cable. Even without encryption, the way Mathematica talks the X network protocol is so inefficient that the xpra method still worked better. It is likely RealVNC will perform the best. I just need to figure out a way for it to start Mathematica without all that extra Raspbian desktop stuff. Last edited by ejolson on Sat Apr 28, 2018 4:46 pm, edited 1 time in total. You never specified what your "host computer" was/is. For my purposes, I assumed another Pi - or some other reasonably modern Linux install - in which case, you can't do it without either using socat (or something like it) or hacking the system to disable the "-nolisten" bug. It sounds like your "host computer" is Windows, running some 3rd party X server (maybe MobyXTerm? ), in which TCP listening isn't disabled. Anyway, yes, using a "newly created" session in RealVNC is probably the way to go. As I said, you'll want to disable as much cruft as you can. Apart from dependencies - I can usually cope with those - are there any other tips/wrinkles/hints you can give for building xpra for Raspbian? You never specified what your "host computer" was/is. The host computer is a PC running Linux. More specifically, 64-bit Debian Jessie using the fvwm window manager configured without dbus or systemd. I didn't know that an automatically configured firewall needs to be disabled otherwise. At any rate, Mathematica seems to rely on a windowing toolkit that does not efficiently forward over the X network protocol. Do you have any tips for setting up RealVNC? Last edited by ejolson on Sat Apr 28, 2018 5:24 pm, edited 1 time in total. Yes, that's the version I installed. The main thing I did when building was to disable the html5 client. I have notes and can post them. I didn't already because performance is still slow. Also, I'm getting a systemd error on startup that needs to go away. Do you have any tips for setting up RealVNC? However, you want to use VNC in the "create a new session for me" mode, not the "MIrror the HDMI display" mode. For efficiency, wouldn't it be better to export the HDMI screen? Presumably this would allow Mathematica to leverage the 2 and 3-dimensional acceleration in the hardware video driver. Is this correct? Here is an update on using realvnc-vnc-server for the Pi Zero Mathematica Dongle. The result so far is that RealVNC appears faster in virtual mode than either xpra or running X directly over the network. Aside from the 3D graphics, it is usable. I would like to try vncserver-x11 in the raspi screen capture mode to see if it makes a difference for 3D performance. Any suggestions how to do this, aside from starting over with a full Raspbian image, would be appreciated. to ~/.vnc/config.d/vncserver-x11 in order to turn on GPU screen capture as when running Minecraft. Now reboot the Pi Zero so the changes to config.txt take effect. Then return to the host computer and connect to 192.168.7.1 using the vncviewer. is still not possible to rotate in a pleasing way using the mouse. From this point of view, using the physical frame buffer seems worse than switching the gpu_mem split to the minimum and using vncserver-virtual. Before deciding on the final configuration, it makes sense to finish by comparing the xorgrdp server. Earlier in this thread I used xpra to make a window running Mathematica from the Zero appear directly among the local windows on the host computer. Since the version of xpra that ships with Raspbian is old, I installed a new version of xpra from source. While this looked great, it resulted in more computational overhead than when using RealVNC. I planned to try with xorgrdp. However, this is again a situation where an install from source is necessary for a valid comparison. Having other things to do, I've decided to skip that step and go with what is working now. Here is my final method for making a Mathematica USB dongle. Since the Zero will be running headless, we need to specify the default size of the video frame buffer, otherwise the resulting desktop will be very tiny. Since I have a 1920x1200 resolution monitor on my host computer, setting a size of 1280x1024 yields a reasonable window into the Zero later. As far as I can tell, many different dimensions will work, though it is possible that odd sizes may affect hardware acceleration later. note that this step should not be done using a public WiFi because the default password is well known and you will also need access to the router to figure out the actual IP number that was assigned to the Zero. There is an alternative method to configure things in which first-time login is through the USB connection. This other method requires either editing files on partition two of the SD card which is Linux format using another Pi computer, or installing the Bonjour protocol on the host computer in order to make the initial connection to the Pi. I will not discuss these alternatives further here. The above file consists of two rules: The first rule assigns any computer at the other end of the USB cable an IP number in the 192.168.13.x subnet. The second rule specifically assigns the number 192.168.13.2 to MAC address 02:46:c0:a8:0d:02 which is supposed to be the other end of the USB cable. While the second rule should be enough, there appears to be an issue with USB gadget driver where it sometimes mixes up the MAC addresses. Having both rules allows things work in either case. If anyone has a solution that fixes this problem, I think many people would be interested. wait for the green light to blink four times, remain steady and then go out. Now plug your Pi Zero dongle into a high-speed port and try again. Note that if you had to start dhclient manually, you will have to stop and start it again to obtain a new DHCP lease after the Zero reboots. Most PCs offer continuous power to their USB ports while plugged in. It is therefore also possible to reboot the host computer while the Zero is running. If you are having trouble getting high speed this may help. For my PC in particular, if the Zero is the only USB device connected and I reboot the Pi, then the USB port gets stuck in full speed mode. Rebooting the PC while leaving the Pi running immediately switches to the correct high speed mode. On the other hand, if there other high speed devices already connected then there are no problems either way. which is even slower than the incorrectly configured USB cable. Note also that there were 5 retransmissions during the test, which indicates a few packets were lost due to radio interference. As an aside, the above numbers indicate why building an OctaPi using WiFi is less effective than building one using wired networking. What remains is to set up RealVNC to allow running Mathematica in a window on the host computer. then select Interfacing Options -> VNC -> Yes. Then, exit the program. RealVNC may not already be installed on the host computer. Fortunately, the needed RealVNC viewer is a free download for Windows, Mac OS/X and Linux as well other commercial Unix systems and even cell phones. Download the correct version for your host computer. It is now possible to connect to the graphical desktop of the Zero through the USB cable. 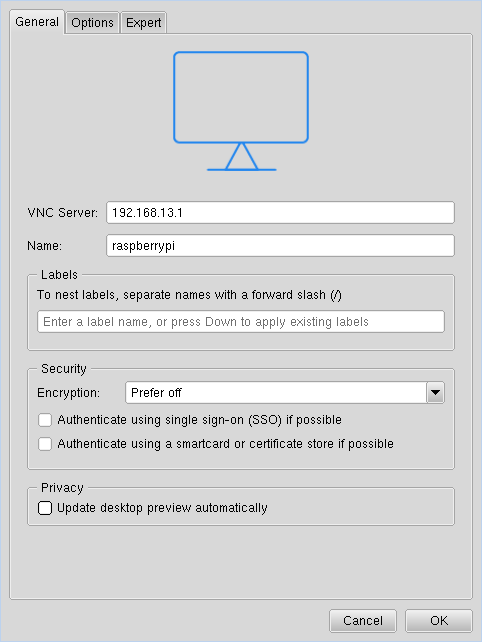 click OK after which an icon labeled raspberrypi should appear in the VNC viewer window. It is fine to disable encryption because all communication is already private using a point-to-point connection over the USB cable. Now double-click on the icon in the viewer, click Continue, set the user name to pi, enter the password for the Zero and click OK. After a moment the full Raspbian desktop will appear exported from the Raspberry Pi to the screen of the host computer. Start Mathematica and you're done. For my PC in particular, if the Zero is the only USB device connected and I reboot the Pi, then the USB port gets stuck in full speed mode. as an additional option on cmdline.txt to force USB 2 high-speed mode. More information may be found in this post which describes setting up a Pi Zero to boot without an SD card using Microsoft Windows.